The Human Side of Healthcare: Cloyd Moody, Jr.
Sharon Harrison, a care management nurse at North Country, cared for Cloyd’s dog while he was in the hospital. 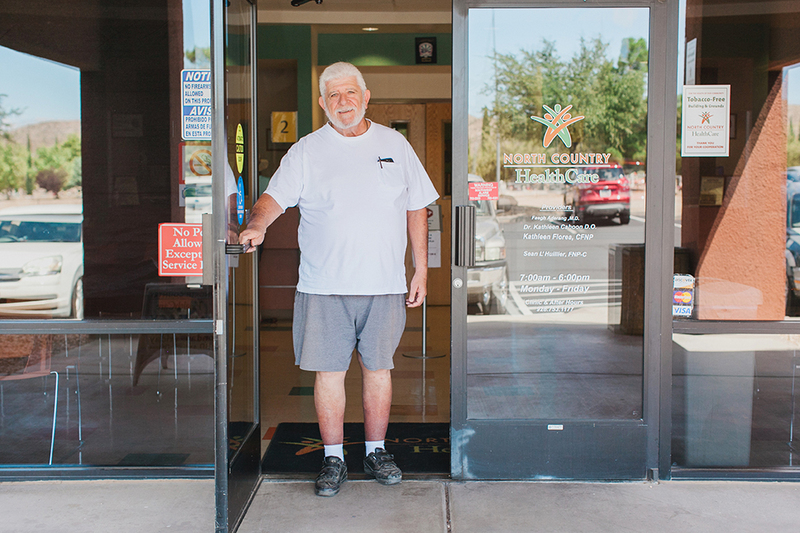 Cloyd Moody, Jr., 70, lives in Meadview, AZ, a community of 1500 residents located on the south end of Lake Mead. In early 2015, Cloyd made the hour-long drive to Kingman to take his dog, Walter, to the groomer. He started to feel short of breath and went to North Country HealthCare for a same day appointment. His healthcare provider, Kathleen Florea, FNP tested his blood oxygen level and found it was dangerously low at 76%. Cloyd took Kathleen’s advice to go immediately to Kingman Regional Medical Center, and when he did, he was admitted right away. Only after the dust settled did Cloyd remember that his dog was still at the groomer, waiting to be picked up. With no family close by to help, Cloyd could think of nothing else to do except call North Country HealthCare. When he explained his predicament, Sharon Harrison, a care management nurse at North Country, agreed to pick up Walter from the groomer and take him home with her to care for him while Cloyd was in the hospital for several days. Cloyd Moody, Jr. visits North Country HealthCare in Kingman for his care. Cloyd moved to Meadview in 2008 after selling his business. He grew up in the suburbs of Los Angeles, and the slow pace in the Meadview community was appealing to him. Unfortunately for Cloyd, access to medical care in Meadview is extremely limited, and he is forced to drive over an hour to Kingman for management of his health conditions: type 2 diabetes and atrial fibrillation (or AFib). Cloyd first became a patient of Kathleen Florea in 2013 and has continued under her care ever since. “I’m extremely satisfied with Kathleen’s care. I feel I can be honest with her, and she’s extremely attentive to me,” said Cloyd. With his free time, Cloyd volunteers at his church, the local VFW post and the Meadview Civic Association. Cloyd lives with his dog and two cats, Muffy and Sasquatch. On occasion, Cloyd and Walter visit Sharon and bring her some of Cloyd’s homemade beef jerky. To help us keep patients like Cloyd healthy do to the things he loves to do, we need your support. Make a donation to North Country HealthCare’s foundation today. Did you know that we’re on the AZDOR list of qualified charities? This means you can donate to North Country HealthCare and get a dollar-for-dollar state tax credit and you don’t have to itemize! 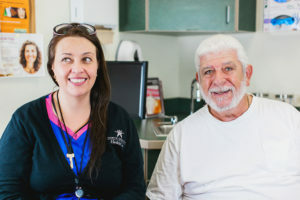 Your generous donations help many of our patients in much need of outside diagnostic tests, home modifications, medical travel assistance, dentures, hearing aids and more. That’s why we’re hoping to raise $25,000 by December 31st. If we raise that amount, we’ll be able to help our physicians provide better care and assistance to their patients beyond the treatment room. We need your help. Can we count on you?